Guess what I’ve been playing? Oh, wait – I already told you, didn’t I? My only complaint about the game is that it was to short. 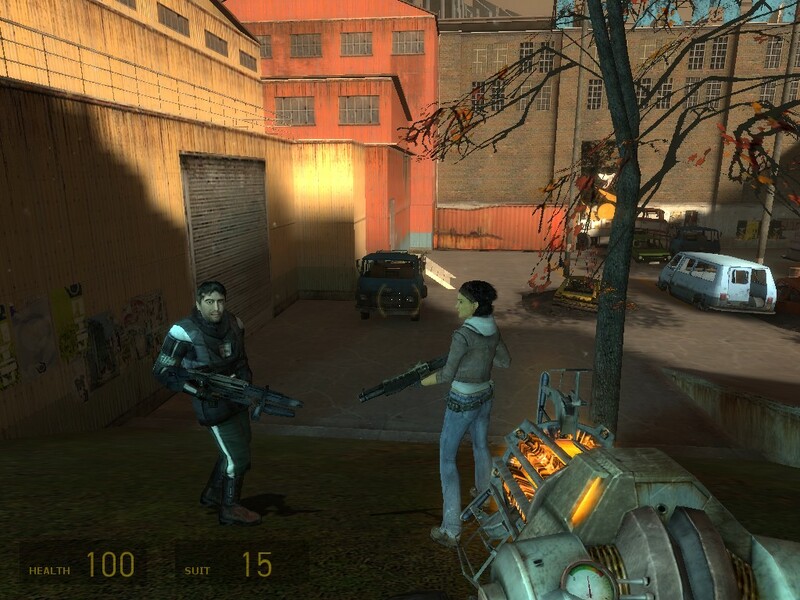 But I guess that’s why they called it “Half Life 2: Episode One” instead of “Half Life 3” or something like that. Other than that it’s pure goodness. 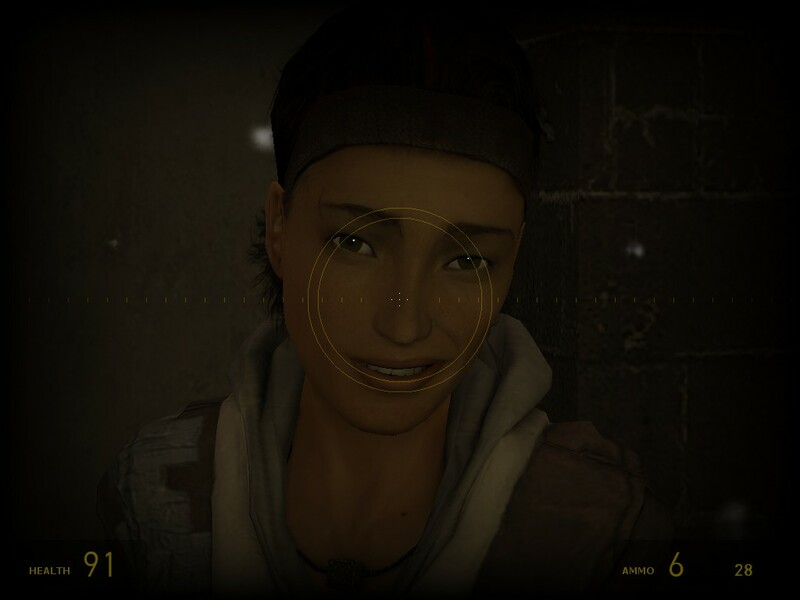 As NPC’s go, Alyx is like no other. I mean, she is no Weighted Companion Cube, but then again no one is. Her scripting is superb. She never gets in the way, almost never dies, and almost never repeats herself. In fact, her combat skills have improved very considerably since the last game. 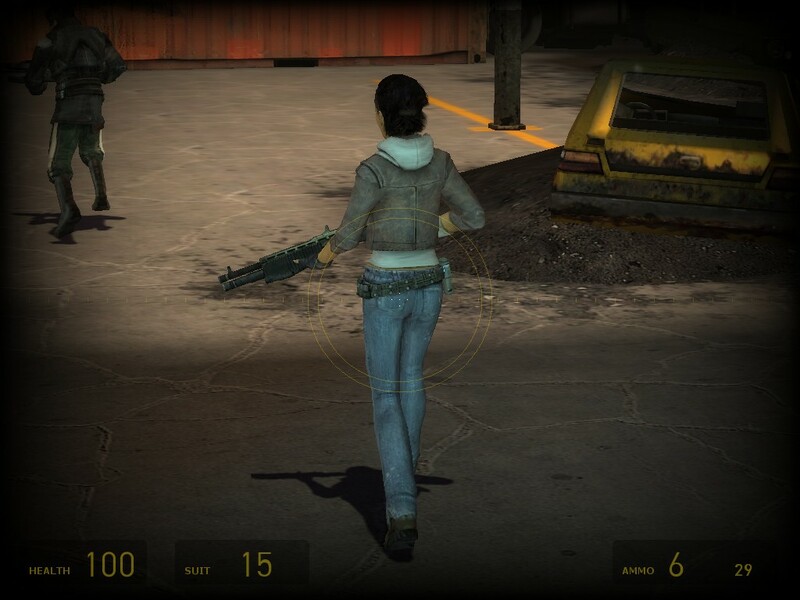 Now she is even able to take down a zombie with a vicious kick to the crotch followed by a head shot. How awesome is that? She also doesn’t die easily. As long as you don’t let her get swarmed she can soak up tons of damage without getting seriously hurt. This means you can sometimes put her in a doorway and use her as a living shield picking off zombies from behind her shoulder. Yeah, yeah – I know. Not hero like thing to do, but hey – I have hit points, and she does not so it works out well. She also warns you when enemies are nearby, points you and incoming hazards and does all kinds of other little things that normal NPC’s don’t usually do for you. My point is that she is genuinely useful beyond the usual opening of doors and and plot exposition. Also, in Episode One her personality comes to forefront. Her character model is much more animated, and they have expanded her range of movements and facial expressions. She makes jokes from time to time, gets excited when Gordon defeats a big and dangerous opponent, and exclaims “I hate these things” when you get nailed by one of those annoying venom head crabs. She also does some lamp shading – for example pointing out Gordon’s uncanny skill at crawling through ventilation shafts. The script also has her play off on the fact that you never hear Gordon speak. When she cracks a corny joke about a “Zombine” it is met with the usual wall of silence from you the player. This time however the silence is quite literal, and Alyx promptly drops the joke embarrassed. Oh, and also she makes zombie noises in the dark to freak you out. Having her on your side is really a joy and you will hate when the game temporarily separates you. I don’t want to give away anything, but the game picks up immediately after the ending of HL2. And yes, you do get to play with the super charged gravity gun once again, but it runs out of juice after you complete certain stages of the game. Other than that, it’s more of the same: more combine troops to kill, more head crab zombies, and ant lions. I managed to forget how much I hate those damn things. In HL2 you get that nice pheromone sack that lets you control them. Unfortunately it gets vaporized by the citadel defense system, so the burrowing insects are once again your sworn enemies. Fortunately Episode One teaches you two new tricks to deal with them. Antlions can be flipped over by a close proximity jolt from the gravity gun. And once you flip them, Alyx can off them with a single shot. The other trick is covering their burrows with heavy objects – like car wrecks. If you push something big and heavy on top of their spawn point, they stop spawning. Of course this is not always easy since they always keep coming but thanks to Alyx providing covering fire you can concentrate on pushing stuff around and then simply push the bugs away with the gravity gun if they get to close. There are also combine zombies – who have nasty habit of pulling out a grenade when attacking. If they catch you against a wall in a way that doesn’t let you immediately run away, you are done for. I learned that the hard way. 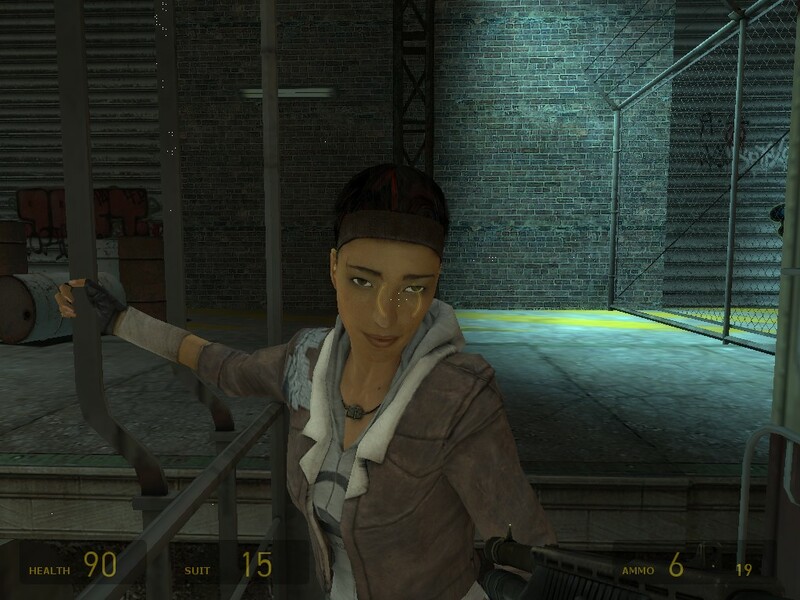 Interestingly, Alyx who doesn’t wear the HEV suit, seems to be much more resistant to granade blasts than you. But I think it’s a game balance thing. If she would die as easily as regular NPC allies the game would become mind numbingly frustrating to play. The ending is another cliffhanger, and it comes way too soon. It kinda blind sided me. I was like: “That’s it? That’s all there is to it?” It pretty much cuts off when it really starts getting interesting. It did make me want to play Episode Two right away, which I guess is what Valve was aiming for. It took me roughly 3 late evenings to finish the game. Then again, you have to remember that I got sucked into it and was playing till obscene hours in the night. If you play casually few hours each night, it may take you longer. If you go all out and decide to play till you pass out, you can probably finish it in a single sitting. It’s longer than Portal, but not by a huge amount. But, for $9 bucks over steam it’s more than a fair bargain. I highly recommend it, especially since the amount of entertainment the game delivers is hard to come by in that price range.